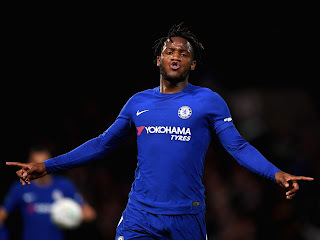 Antonio Conte has informed Michy Batshuayi he has to prove he can be better than Eden Hazard and Alvaro Morata if he is to play regularly for Chelsea. Michy Batshuayi might get a chance tonight when Chelsea takes on Bournemouth in the League Cup. Should he be named in the starting 11 for the game it will be just his sixth start this term - a situation that has led to rumours he could leave on loan during the January transfer window. Conte has now made it know that Batshuayi can still become a regular at Stamford Bridge if he proves himself. "Michy is coming from an injury. Don't forget this. Michy stopped for maybe two weeks, 18 days, and then he needed to work,' Conte said before tonight's quarter-final showdown. "Now I think it's right for him to start the game against Bournemouth in the Carabao Cup. But I repeat: in every game, I have to make the best decision for the team." "Against Huddersfield, we won 3-1 and I think I made the best decision to start with Hazard, Pedro, and Willian. It was the same against Southampton. Every game I've played Hazard, Pedro, and Willian together, they've won. Last season and this season." "He has to show me that he's better than Morata, or than Hazard. It's very simple." The Chelsea Boss also highlighted that Batshuayi has been given far more opportunities this season than last when he started just one Premier League game. "Don't forget that Michy, this season, is playing more than last season. Last season he didn't play. He didn't play and I think this season if you consider his injury for a month, he had his chance." "When you are a striker in this crazy market, your valuation is very high only because you are a striker. And then, Michy is a young player. He has to work very hard to improve himself." "But he is doing this. I'm happy with his behavior and his commitment. But I have to make the best decision for the team. Otherwise, when we lose, you say to me: "You are in trouble because you lost", not because I took this decision or that one." "Sometimes I can make the best decision. Sometimes I make a wrong decision. This is part of my job. But there is only one thing that every single player has to consider: my honesty. When I decide about a player, the last part of the body I see is his head."